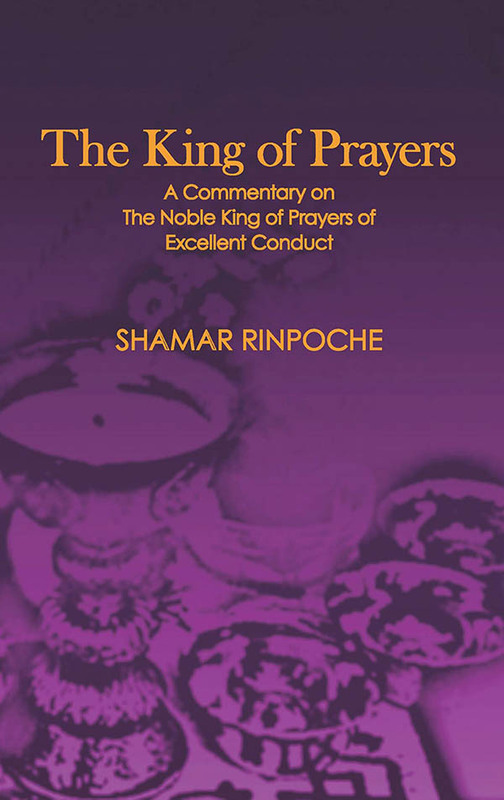 The King of Prayers has been newly released on Amazon.com. A portion of the proceeds will benefit Nepal. In December, 2009, in Bodh Gayā, Künzig Shamar Rinpoche gave a teaching on the Noble King of Prayers of Excellent Conduct, also know as the Samantabhadra Wishing Prayer. Buddha Śakyamuni gave the teaching of the Samantabhadra Wishing Prayer to urge practitioners to treat the great Bodhisattva Samantabhadra as a role model to emulate so that all their wishes may be accomplished. The teaching by Shamar Rinpoche in 2009 was transcribed and published as a first edition in 2011 by Shanti Path Publications of Kathmandu, Nepal. Bird of Paradise Press is happy to announce the republication of this transcription in a book which also includes the Tibetan text and an English-language translation of the prayer. With the release of this new edition on May 18, 2015, Bird of Paradise Press will be donating a portion of the proceeds from the sales of this book to rebuilding efforts in Nepal, which suffered two recent major earthquakes near Kathmandu. We are grateful for the commitment of the many contributors to this edition: Edited by Julia Stenzel, Thea Howard, and Lara Braitstein. Prayer translated by Pamela Gayle White under the guidance of Shamar Rinpoche. Cover image from a photograph by Paul Steinbrecher. Interior graphics developed from a photograph by Alex Watkins. To order this title today, please visit these pages at Amazon: USA, UK, Germany, France, Spain Please sign up for our email newsletter to receive updates from the press.